Christopher Creighton is constantly improving his circular On18 layout, Ganaraska Stone Quarry Tram. 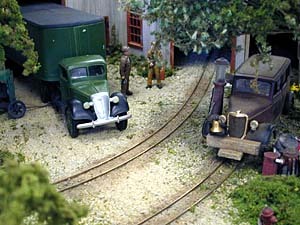 He brought it from Toronto to the 2002 Midwest Narrow Gauge Meet where these shots were taken showing the high level of craftsmanship and completion he’s achieved. This delightful photograph arrived in the e-mail one day, unattributed. If the photographer will identify himself/herself, I would like to extend the proper credit and congratulations on making a great shot! 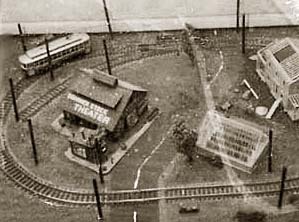 My very first model railway was a micro layout, in the early 1960’s! 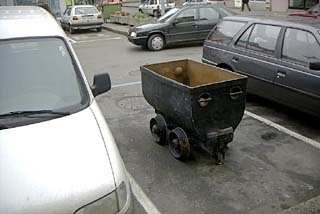 It was a 12″x24″ loop of track with a single siding, running a couple Brill four-wheel and eight-wheel trolleys. And yes, the overhead wire actually carried current. This ancient Polaroid photo has seen better days, but it accurately depicts my micro Roots. Bliss Bignall, of San Angelo, TX created this very large pizza layout in On30, as a Christmas attraction for his local train depot. It’s about four feet in diameter and has no turnouts. The immediate inspiration, Bliss reports, came from a hobby-shop sale of HO sectional curves for 50 cents a package. It was too good a deal to pass up! Bliss is also working on a new small layout with tighter curves and some turnouts. We hope to bring you more news of his efforts in future scrapbook pages. FULL-SIZED MYSTERY MICRO FOUND IN OHIO! While driving through Burton, Ohio on a recent weekend, I was brought up short by the sight of a narrow-gauge railroad running at right angles to the highway. 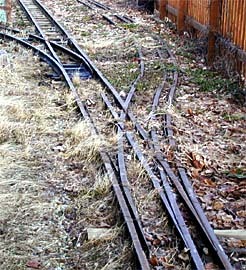 Upon investigation, it proved to be a real life micro layout, with both 15″ and 12″ gauge trackage (and a fascinating dual-gauge turnout – above right). 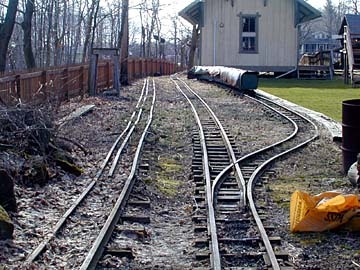 The little layout appears to serve a sawmill (behind the station in the photo above left) and it also has some carriages (shrouded for winter on the passing siding) for taking kids and railfans for a ride. Alas, it was too early in the spring for the road to be open for business, and no one was around to ask. It appeared to be on the extreme edge of Century Village, a reconstituted colonial community — in fact, you can see the Village boundary fence at the left above. But no information I can find about the Village even mentions the little railroad! Does anyone have some more information, particularly about rolling stock used? The little line is only about 300 yards long. It’s a natural for modeling! Here’s a quick sketch of the track arrangement … a life-sized micro layout!